The crisis surrounding three blocks of council housing on K nemocnici street, in Bánovce nad Bebravou, a small town in Slovakia, may appear to be just a local issue. While this issue may seem to concern only a population casually referred to as “maladapted”, upon closer inspection the problem takes on a more universal character. On November 1st, the short-hold lease on three council housing blocks in Bánovce nad Bebravou, predominantly inhabited by Roma people, expired. The city council decided not to extend the contract which had, previously, been renewed several times without issue. Instead, the inhabitants were asked to vacate the premises until December 1st. In response to on-going problems with the state of these buildings Michal Schlesinger, a representative of the council, has offered a ‘solution’ that has resulted in the eviction of 400 people onto the street in winter, during the advent season. ‘One solution is for these tenants to find new accommodation, or to stay, temporarily, with relatives, after which they can start afresh.’ It is, however, unrealistic to expect approximately 400 people, including families with small children, the elderly, invalids, or otherwise disadvantaged tenants, to find alternative accommodation for just a month in a town the size of Bánovce nad Bebravou (population: 18,000). Thus the question remains, why has this decision been taken now? Once again, the political party most active in this affair is the local branch of the Kotleba’s far-right party, ĽS NS. Springing up out of nowhere, ĽS NS local representative and businessman, Anton Grňo, became involved in the situation. Grňo regularly riles up local inhabitants, not only setting them against the aforementioned tenants, but also against local authorities, claiming that the city’s intention is to secretly build a new blocks of flats, despite its refutation of such claims. 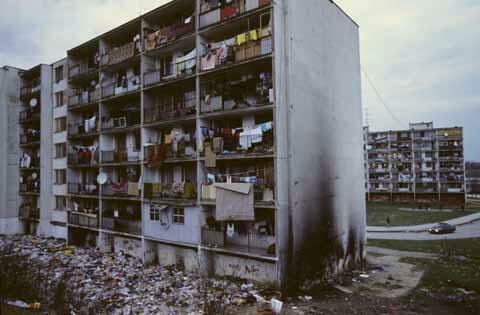 It is clear, upon visiting K nemocnici Street and these blocks of flats, that this is a particularly tense situation. Proti Prúdu, an NGO focusing on the problem of homelessness in Slovakia, and Michal Zálešák, a lawyer from the European Centre, have pointed to the fact that the council’s decision violates the UN’s International Covenant on Economic, Social and Cultural Rights. They claim that the city is responsible for the welfare of their most vulnerable inhabitants, as well as for maintaining the state of property in the city’s possession. Another marginalized site, Luník IX, in Košice, home, once again, to a largely Roma community, is likely to experience similar problems. Two blocks of flats are to be torn down and the city has called for the immediate vacation of the premises. Six blocks of council housing have already been torn down in this area, resulting in the inhabitants ending up in the nearby settlement. In such cases, it is clear that the improper administration of cities creates a vulnerable population, resulting in homelessness and the rise of informal settlements. 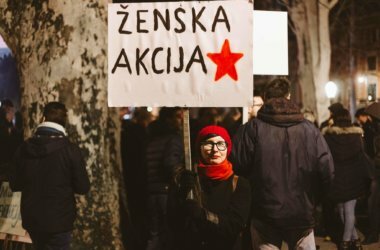 It is shameful that there is no law in Slovakia that would force local authorities to provide alternative accommodation, and protect tenants from eviction in winter. However, the underlying issue is that accommodation is unaffordable and this problem is compounded by the absence of a social housing act which protects a fundamental right to housing.